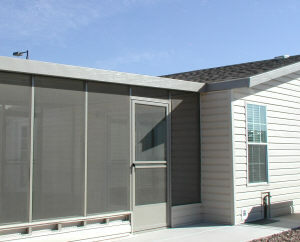 A large percentage of our business is providing shade in Arizona retirement communities. 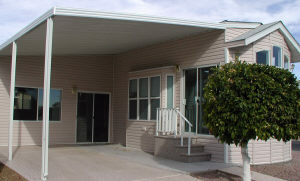 These include Mobile Home Parks, RV Parks and 55+ housing communities. Arizona is a great place to spend the winter, and as many retired folks are finding out, it's not a bad place to live year round. Years ago the RV Parks of Arizona became ghost towns during the summer months, and that is not the case anymore. Seniors are finding Arizona to be very livable and enjoyable year round. Our country's state of economics is playing a role also, the trips back and forth to the north country keeps getting more expensive, as do the costs associated with maintaining two households. So when faced with the choice of enduring cold, snowy, winters or enjoying year round sunshine, many retirees are choosing Arizona as their only place of residence. The term "snowbirds" is used to refer to our states winter visitors, those that come to stay here just a few months out of the year. Snowbirds are turning into residents at a fast rate, and for many good reasons. Most of the Mobile Home Parks, RV Parks and retirement communities have a swimming pool, an active recreation hall, a golf course, a tennis court and plenty of transportation for shopping, dining and other Arizona activities. Another trend that is becoming popular for Arizona retirement is having two residents in the same state. Seniors stay in their favorite RV Parks around the Mesa, Apache Junction, area during the winter months and as the weather warms in the spring they head north. Not north as in Kansas or Canada, but north as in northern Arizona. Places like Show Low, Prescott and Flagstaff have growing retirement communities, and are the perfect places to escape the desert heat for a few months. Having two Park Models is much less expensive than having a house back home needing year round maintenance. Many retiring folks are giving up the "house". Some take to the road in their RV while others settle in places like Arizona. Wherever you are in Arizona, be sure you have plenty of shade. Shade is a big part of what makes Arizona not only a livable place, but a great place to enjoy your retirement years. Use the Contact form and let us know how we can help you, we are expert shade builders, and have been for many years.